At Atlassian, we’re committed to making software affordable and providing our customers with the best experience. We heard your feedback on our previous pricing model, and we’ve made changes. When we first launched Jira Service Desk, we focused on delivering a great set of features to our existing Jira customers. Our goal was simplicity, which was why we used our existing Jira add-on pricing model (total user base as calculated by Jira). But many organizations indicated this pay-per-user pricing model didn’t work for them. This is because most companies have a small number of agents in comparison to their service desk customers. We took this feedback very seriously, and today’s change in pricing – to agent-based pricing plus the required Jira user tier – is a direct response to that feedback. We believe this new pricing model serves more of our customers. It took nine months, over 100 Atlassians, and the cooperation of 10 teams. And it was worth every ounce of effort. 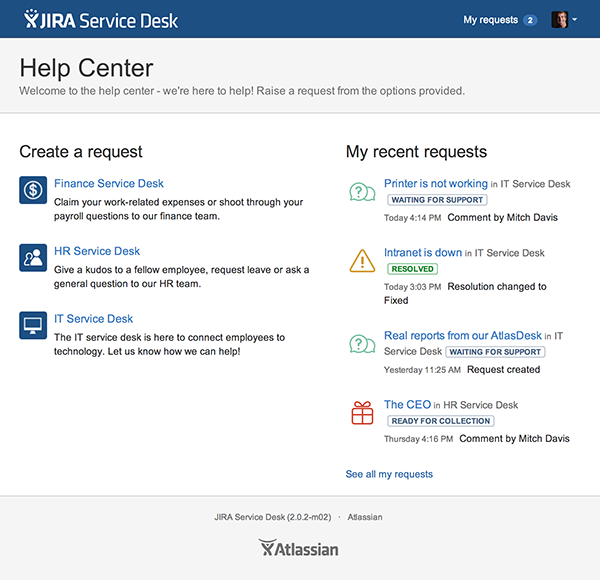 Now you can get started with Jira Service Desk at three agents for $10 per month. Teams with more than three agents pay $25 per agent per month. To keep things simple, we have one new pricing model for all the Jira Service Desk features. Find out more about the new pricing. Existing customer? Learn how this change will affect you. Self-service isn’t just for the IT group. It can benefit every team within your organization. Let HR, Marketing and Legal in on the secret: Now they too can manage their workflow, prioritize, and report in one system. With our new pricing model, a team of three agents can serve the entire organization at a cost of $10 per month. Now, you can easily access all your organization’s portals with our new central portal. Would your customers sooner give up coffee than their email? With Jira Service Desk 2.0, customers who love to work from their inbox can create and track requests by email. Create via email, reply via email, and get updates via email. Create a new service desk inbox (such as servicedesk@yourcompany.com). Turn on email requests in the Email setup menu. Jira Service Desk will automatically convert all incoming emails into the request type of your choice. Have all your agents manage customer requests in the same queue – whether they were created from the customer portal or by email. When customers send an email with an attachment, it will be automatically added to the ticket. Send an email to multiple service desks, and create a ticket in the corresponding service desks. On-boarding a new employee becomes ridiculously easy – a single email can trigger an HR, IT equipment, and security badge request. Now, get complete visibility into how many issues each agent has in progress. The color-coded bar highlights issues that have breached, are at risk, or are within the service level agreement (SLA). You can make sure that your team isn’t slammed with work and your agents focus on the right priorities to meet the SLAs. Solving problems often requires work across teams – or help from experts like Jen, the ace from the engineering team on level 8. Does your software team run on Jira? Get your IT, engineering, and operations teams on the one system. Set up your developers as collaborators and let them help your service desk agents. A collaborator is a Jira user who can see tickets and make internal comments, but cannot publicly respond to customers. There is no limit on the number of Jira users who can be added as collaborators to a Jira Service Desk project. We know you’re busy. That’s why we built a new experience that will guide you through Jira Service Desk’s setup in about 10 minutes. Right off the bat, understand the power under the hood – and get a full grasp on just how much you can do with Jira Service Desk. Let’s solve more problems faster, together. This release addresses 438 votes on JAC.